Make the best looking mobile video in your life with the v6 update to FiLMiC Pro. Powerful new controls put the world’s best video camera app, light years ahead of the competition. With version 6 we’ve completely re-designed the way you shoot with three unique shooting modes. 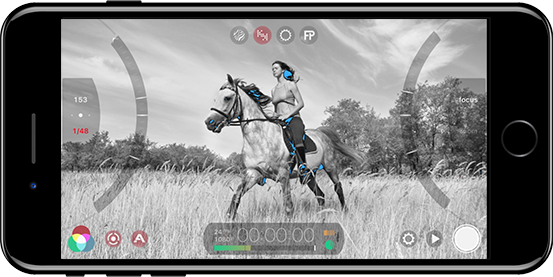 Precision control over focus, ISO and Shutter Speed are a breeze with the new Manual Arc Sliders from FiLMiC Pro. If simplicity is your thing, the redesigned Reticles allow for tactical drag and drop focus and exposure control. For the Pro’s you can select any combination of the two for a hybrid mode to match whatever conditions come your way. 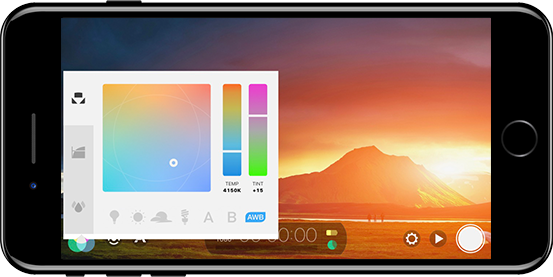 See color in a brand new way with our visual guide to temperature and tint. Loaded with easy to use presets for daylight, shadow, tungsten and fluorescent light as well as lockable auto white balance option. Professionals have been asking us for LOG or Flat Color profiles and we are thrilled to now offer these groundbreaking options. LOG and our less extreme Flat gamma curve in our new Cinematographer Kit* give filmmakers all the latitude they needed to color grade data rich content for spectacular results. 4 Gamma Curves, along with Shadow. 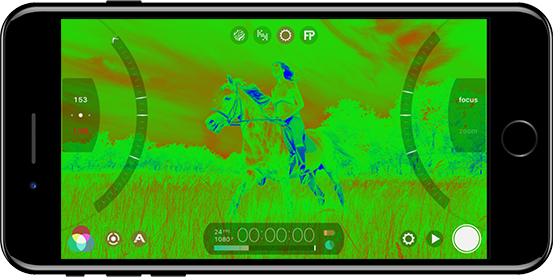 New live analytics give the shooter detailed feedback through focus peaking, zebra stripes, false color and clipping overlays. Simplified or Advanced modes give you short term feedback or detailed analysis. Combined with our tri-modal histogram and wave form monitor and you have all the analytic data you need. This overlay assists with setting exposure by overlaying the image with red forward stripes for areas of overexposure. Blue backward stripes indicate underexposure areas. Just like when using a luminance histogram, the clipping overlay shows you areas of exposure that are ‘clipped’ which indicates complete data loss. Red is overexposure clipping and blue is underexposure clipping. Shows you a complete picture of your video’s exposure profile. Remember that “green is good”. Areas of red indicate overexposure and blue indicates areas of underexposure. Micro-Contrast Focus Peaking (pat pending). Focal accuracy on a per pixel level provides better insight on focus acquisition than ever before. Light blue indicate areas of focus and green indicates the target is in critical focus. Note: our live analytics is only available on iPhone 6 and newer models. 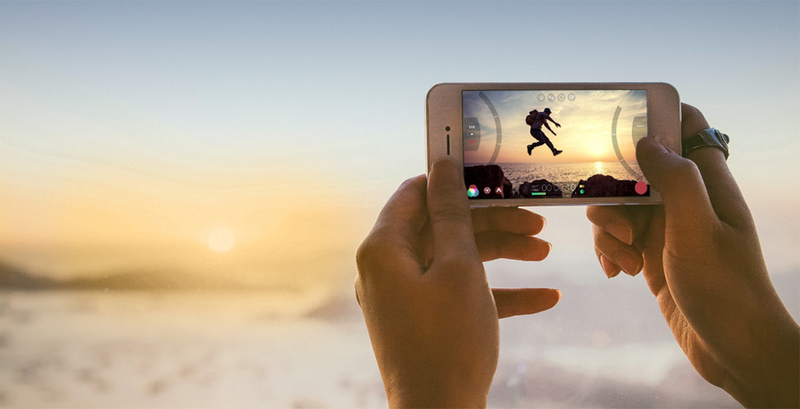 Wherever you are in the world FiLMiC Pro has you covered. Shoot 25 fps PAL in ROW countries, 30 fps NTSC or our default 24 fps for beautiful, cinematic images. Slow motion, fast motion, a host of resolutions and aspect ratios mean you can achieve whatever it is you envision. Whatever Your Favorite Accessory, We Support It. 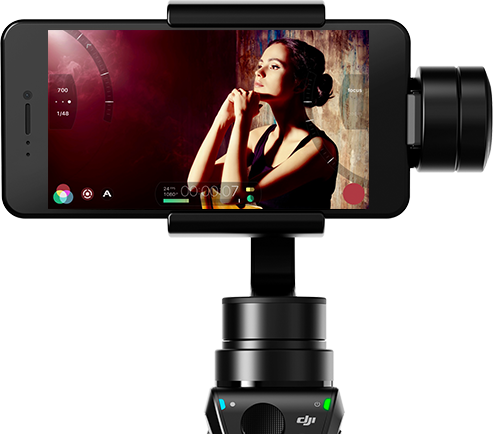 FiLMiC Pro proudly supports integration for your DJI OSMO Mobile, Moondog Lab anamorphic adapter, BeastGrip 35mm adapter or stereo microphones from some of the world’s best audio manufacturers like Shure, Sennheiser and Rode. Quickly sort, select, batch and share your favorite clips from within our powerful and elegant FiLMiC Library. Trim, edit your mage settings, downsample and then share videos to all your favorite mobile editing apps, or social media or cloud drive targets. Shoot professional quality video with your mobile device.